I just got back from SUCH a fun weekend. So much happened and I have so many pics that I'm going to break this up into two parts! Friday afternoon I picked up my friends Amanda, Jennifer and Laurie and we drove to Branson. We got cheap flights out of there to Atlanta. We met Hillary there. The Branson airport is interesting. It looks like some kind of lodge (like Big Cedar if you are familiar). It's really nice and there is like one flight out a day - so security was a breeze! Here we are in front of the waterfall in the airport. We were so excited to be headed out for a girls' weekend! When we arrived in atlanta - we were greeted by blog friends Caroline, Jenna and Faith! They came to pick us up. We had a blast with them and they were so sweet to drive us around all weekend. I'm so thankful because we would have been LOST without them. It was pretty late but we were hungry so we headed to an Atlanta must visit - The Varsity! We had our picture taken by our waitress who told us (in a very pleasant manner) that we needed to get out of that part of town because people could "just be trying to watch the TV and people would come in their house and rob them blind" and then she showed us that she was packing a stun gun. Needless to say - we were loaded up in the cars and headed out within in about 5 minutes. ha! (Yes - I realize I look 8 months pregnant in this picture - I promise it's the dress) (and maybe those onion rings I ate). We stayed up talking WAY TOO LATE and got up WAY TOO EARLY. (so much for all the sleep I could get without Harper.) ha! Saturday morning I went to Cracker Barrel and met up with some fun bloggers! This is Rachel, Kim (she made Harper's name painting in her room), Jennifer and Natalie (they are twins if you can't tell). Lyndsey, Lianna, and Amy also met up with us. It was nice to visit with each of these girls. 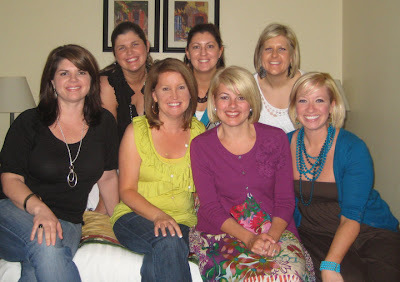 I didn't get to stay long because my ride was leaving EARLY to line up to see Beth Moore. It's fun to meet people you have only seen on blogs or twitter and hear their voices and see them in real life. It's almost a little surreal. Next up........................The Beth Moore Conference and the rest of the weekend! (P.S. If you are wondering what Harper has been up to over the weekend - you can check out here: www.hisdoorkeeper.blogspot.com).